Musikfest is a staple of Lehigh Valley life. In fact, it’s the festival that began the festival culture in the area. Believe it or not, Musikfest is the largest free music festival in the United States. Seriously. 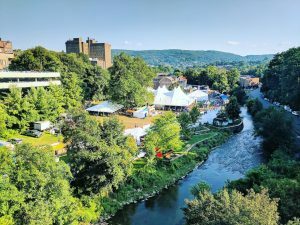 And, with that many people coming in, there are always a few ways to make sure that you’re not only playing it safe, but also getting the most out of the biggest music festival in the Lehigh Valley. Downtown Bethlehem has two parking decks near center city at Main and North streets and at Walnut and Guetter streets. There will always be other places to park for a fee, or just straight up street parking. No matter where you park, be sure to set a GPS pin on your phone using an app like Google Maps or Waze to be sure you know where you parked. Musikfest, at least in 2018, still uses the ticket method for purchasing food and alcohol. This means that you need to buy tickets at kiosks with cash or a credit card before you can buy food or alcohol on site. Everyone is going to have their own amount of items to carry. If you’re a family with small children, you’ll be using a stroller. However, if you’re a person who is just visiting Musikfest with friends, it may not be a bad idea to bring your own bag to secure your wallet or other items. Grabbing an Uber may not be the worst idea if you’re coming to Musikfest from out of town, or even a few blocks away. Be smart when you have a few drinks.